Douglas Adams was a staunch atheist and a lover of animals. Two things of which I highly approve. He got his big break writing a sketch for “Monty Python’s Flying Circus”, and made his first small screen appearance in one of their skits (coincidentally in episode 42). However, his most famous contribution to society comes in the form of a science fiction series originally envisioned and broadcast on BBC Radio. For those of you who don’t know the work of Douglas Adams (and if you don’t, your shame should be enough to make you immediately buy The Ultimate Hitchhiker’s Guide to the Galaxy) he is most notably known for the aforementioned novels, and today would have been his 59th birthday. I am not a fan of things set in space, with the exception of Mel Brooks’ Spaceballs, Nickelodeon’s late 90’s television series “Space Cases”, and most importantly, The Hitchhiker’s Guide to the Galaxy series by Douglas Adams. This series includes the novels: The Hitchhiker’s Guide to the Galaxy, The Restaurant at the End of the Universe, Life, the Universe and Everything, So Long, and Thanks to All the Fish, and Mostly Harmless, and has jokingly been referred to as a trilogy in 5 parts. 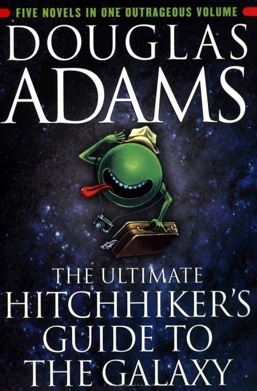 The most impressive aspect of the Hitchhiker’s series is the way in which Adams combines extremely well developed characters with an amazing plot and a unique voice. The series centers around the last two survivors of the human race, hapless, unlucky bathrobe wearing Arthur Dent and Tricia McMillan AKA Trillian, renowned mathematician and astrophysicist. After earth is demolished by a race known as Vogons to make way for a hyperspatial express route (AKA space highway), Arthur is thrown into a continuous series of adventures in which he learns that the most useful thing a galactic hitchhiker should carry is a towel, and the answer to the life, the universe, and everything is 42. At least according to a hyper-aware super computer the size of a planet named Deep Thought. As for humanesque creatures, there is Zaphod Beeblebrox, the President of the Galaxy, who has three heads, two arms, and a cousin with whom he shares three mothers, Ford Prefect. Ford chose his name for what he believed to be the dominant life form on earth, the popular British vehicle, the Ford Prefect. Not as central to the novels, but interesting in his own right is Slartibartfast, who creates planets for a living, specifically working on the coastline of Norway, which happened to be commissioned by a pair of extremely intelligent entities. These same entities happen to be disguised as mice for a good portion of the series without anyone’s knowledge. By far, the best character in the series is Marvin the Paranoid Android, a robotic prototype who is prone to extreme bouts of depression due to his extremely large brain mass (think Eeyore but robotic and not shaped like a donkey). This boredom is brought on by his vast intelligence. Everything is so easy and thus so boring. And now, thanks to the movie version I cannot help but imagine him speaking as manic depressive Alan Rickman. Marvin also does some time jumping of his own, culminating in a big reveal in So Long, and Thank For All the Fish, in which Arthur finds him on a planet containing, “God’s Final Message to His Creation”. I could tell you what it is, but it would ruin a truly magical moment. Plot devices such as the babel fish, a small yellow fish you insert into your ear which translates other languages for you (yes, I’m pretty sure this is where the awful online translator got it’s name from) abound, along with wackiness and utter hilarity. Dolphins are the first to be aware of the destruction of earth, and try to warn humanity, although society takes their antics to be mere playfulness rather than warnings of impending doom. Their final message before leaving earth is, “So long, and thanks for all the fish” which coincidentally was the only redeeming bit from The Hitchhiker’s Guide to the Galaxy movie adaptation, which was otherwise forgettable. A fan of word play, Adams introduces two pieces of unique technology: the Infinite Improbability Drive and the Total Perspective Vortex. The Infinite Improbability Drive is located within the spaceship known as the Heart of Gold, and is designed in conjunction with this drive to allow travel, “through every conceivable point in every conceivable universe almost simultaneously”. When Ford and Arthur are shot out into space by Vogons, it looks like their lives might end there and then. But in a moment of sheer improbability, in which Ford Prefect starts morphing into a penguin, they find themselves aboard the Heart of Gold, despite a 22079460347 to one chance of being rescued. The Total Perspective Vortex is a torture device on Frogstar World B, and preys on a basic human fear, that we are insignificant. When one is placed inside the vortex, they see, “one momentary glimpse of the entire unimaginable infinity of creation, and somewhere in it a tiny little mark, a microscopic dot on a microscopic dot, which says, ‘You are here'”. The only person to survive this torture is rumoured to be Zaphod Beeblebrox, who merely saw this own egotism at play. The main thrust of the plot, as aforementioned above, centers around Arthur, his travels through space and time, and the ridiculousness that ensues. There is so much that takes place in these five books alone that to explain all the plot twists, jokes, and nuances of the series would be a never ending task that even Atreyu could not hope to accomplish. Suffice it to say, he travels the galaxy, learns the answer to the Ultimate Question (if not the question itself), cements friendships, sparks romances, and most importantly escapes from the hum drum life he left behind. Adams takes the tropes of science fiction: time travel, alternate universes, warring aliens, and makes them fresh through a fine tuned awareness of humour as only a British man can achieve. Imagine that Terry Pratchett’s interwoven plots, Jasper Fforde’s wit, Neil Gaiman’s sense of the absurd, and the futuristic components of The Fifth Element had a child. This baby would be Douglas Adams’ The Hitchhiker’s Guide to the Galaxy. And if that’s not enough to get someone to pick up the series, I don’t know what is. If you have yet to read these novels, the sharp, finely tuned hilarity might seem like a daunting task at almost 900 pages. But take a chance, and take a ride to the farthest reaches of the universe. Discover a wondrous place that is better experienced than described. Do yourself a favour and start reading. Most importantly… Don’t panic. Your post makes me want to reread the series right now. Few books are laugh out loud funny, and Douglas Adams gets me every time. It’s so absurd and satirical and *human,* despite the space setting. Thanks for reminding me about how much I love and miss this series! This brings up back to the problem that we need to have a lot more money, which leads back to rich benefactors. If I had time, I would be re-reading this series RIGHT now.